Mixed Media on paper 14” x 11” in 20” x 16” frame. Aptos is south of Capitola, which is south of Santa Cruz. It’s my favorite place. I have painted it before, but not this specifically. Here you can see the pier with the old cement ships that were scuttled at the end to make extra space for seabirds to rest. The ships don’t look like that now. They took quite a beating in recent winters. 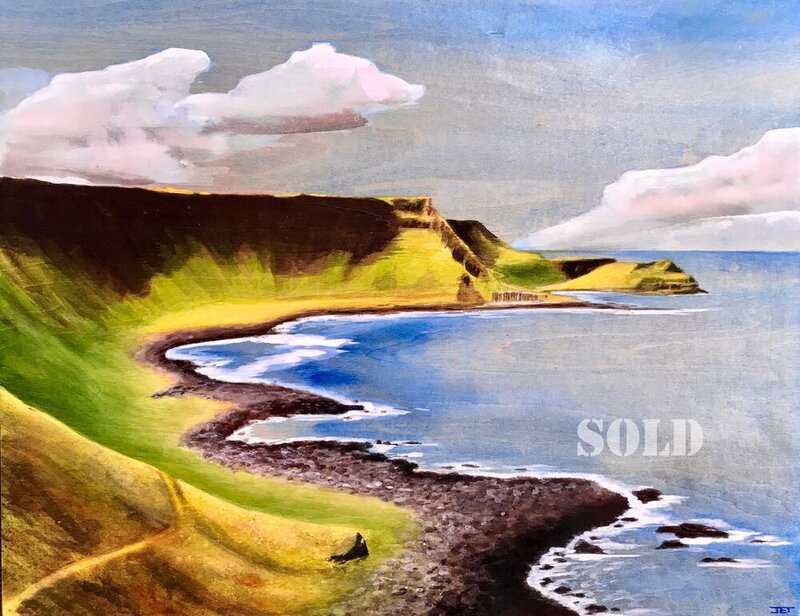 I took a walk along the cliffs of the Giant’s Causeway area of the coast of Northern Ireland and this is what I saw, translated through acrylic inks on a wooden gallery board. With any luck, you can see the wood grain through the transparent inks. I can see this view from a favorite window in my sister’s house. Except the scene below is overbuilt and overrun by vacationers and locals. This is how I imagine it looked at one time. Acrylic on gallery wrapped canvas. 36" x 24"
What if Mondrian saw the Pacific Northwest Forests and had a slight stroke? This buffalo has seen major changes in his surroundings. Physically and metaphorically. This canvas used to look much more conventional, then one day it became this. Acrylic on gallery wrapped canvas. 36" x 12"
Is it how the lighthouse feels to me, or is it how the lighthouse feels inside? You decide. 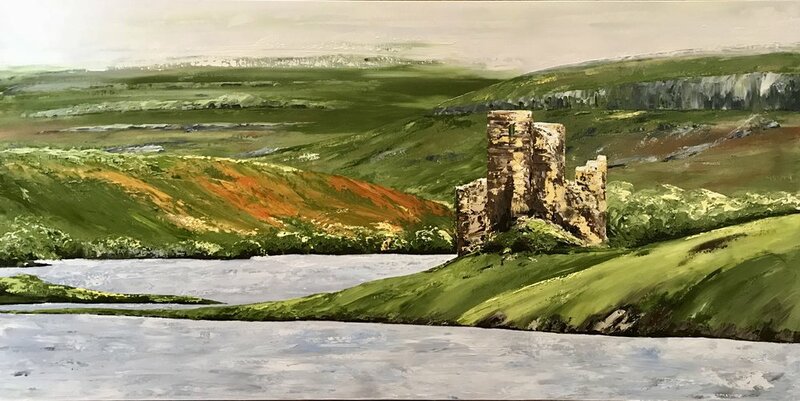 This is an impression of some castle ruins we visited in the highlands of Scotland. The mist was rolling in and it couldn’t have been more romantic looking. Watercolor on paper, 14" x 20ish"
When you buy a tyrannosaurus, you've got to get it home. Just something to think about. I couldn’t sleep after watching too many episodes of the Great British Baking Show. I envisioned how I might apply paint by piping it on like icing. The next day, hijinks ensue. This is my impression of a slot canyon in Utah's Arches National Park. It's a good-sized piece at 24" x 36." Oil on gallery-wrapped canvas (palette knife application). An impression of the view of the highlands from the highway that crosses the north coast of Scotland. The mountain is called Ben Hope. You're spinning along a road in the fall and the colors just keep coming at you. That's the inspiration behind this good-sized canvas. It's 30" x 40," oil on gallery-wrapped canvas (palette knife application). Mixed media triptych. Masa and watercolor paper mounted on wood cradle boards about 38" x 12" when hung. My first attempt at a triptych. I learned that continuing straight lines through triptychs look cool but are a technical backside 1440 quadruple cork with a nosegrab. Am I right, snowboarders? Early morning driving through the woods by the Metolius River with bonus bear. Oil on canvas. 20" x 20"
One of my favorite mixed media pieces. It looks impressive here, but it is actually quite petite. Fits anywhere! Acrylic on wood. 20" x 20"
Watercolor impression of a photo of a slot canyon along the Fiery Furnace trail in Arches National Park in Utah. This is based on a photograph I took at Portland's Japanese Gardens. To get a few more reference photos as I painted, I googled "Portland Japanese Garden Tree" and hundreds of photos of this exact tree popped up. Turns out it's a favorite of many other Portlanders, and for good reason. So photogenic. 36" x 30" in a "repurposed" frame I found in a second-hand store. Oil on canvas, both brush and palette knife application. Acrylic Ink on wood. 48" x 12"
There's a pullout on Highway 1 along the Oregon Coast when you are almost at your destination. This is what you see. This is acrylic ink directly on bare wood. You can see the wood grain through the ink, which makes it a one-of-a-kind piece. I will be making more like this, but each one will be a little different depending on what the grain of the wood suggests. For my firefighting family. Oil on canvas. 20" x 16"
2014 Oil on canvas (palette knife application) 20" x 20," gallery-wrapped canvas. Looking up through the evergreen canopy in a Redwood forest. If you haven't done it in a while, I recommend it. Anyone who has hiked the Misery Trail on Smith Rocks in Central Oregon will recognize this guy. A medium-sized (18" x 24") framed canvas. Palette knife-applied oil. Oil on Canvas. 18" x 24"
View of a barn in the Felida neighborhood of Vancouver, Washington. Torn down in 2016 for a housing subdivision. A large format piece: 36" x 48." Looks great on an impressively large wall. Especially if you're a fan of the Deschutes River Falls Trail outside Bend, Oregon. Oil on canvas, palette knife application. The colors of the rocks in Sedona can be startling - the reds up against the greens of the junipers. But if you look up sometimes it's even more breathtaking. A medium-sized piece at 18" x 24." Oil on gallery-wrapped canvas (palette knife application). Montage project for all my greyhound buddies. 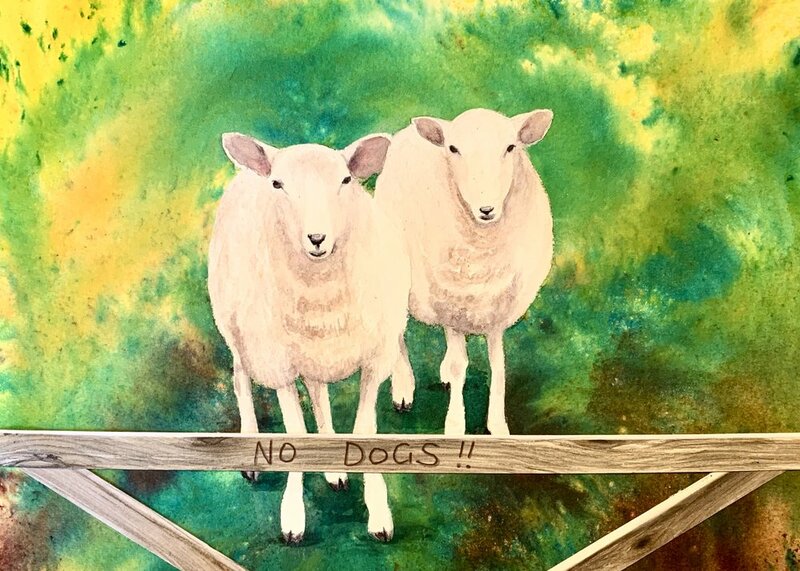 Acrylic Ink on paper, mounted on wood. 12" x 12"
Oil on heavy-duty gallery wrapped canvas. Brush and palette knife. This is not an exaggeration of the beauty of that morning in that place. You can find this view in a boat off the Na Pali Coast of Kauai. Or maybe you remember it from an adventure of your own. Oil on gesso board, palette knife application. 24" x 18." Oil on canvas (palette knife application). 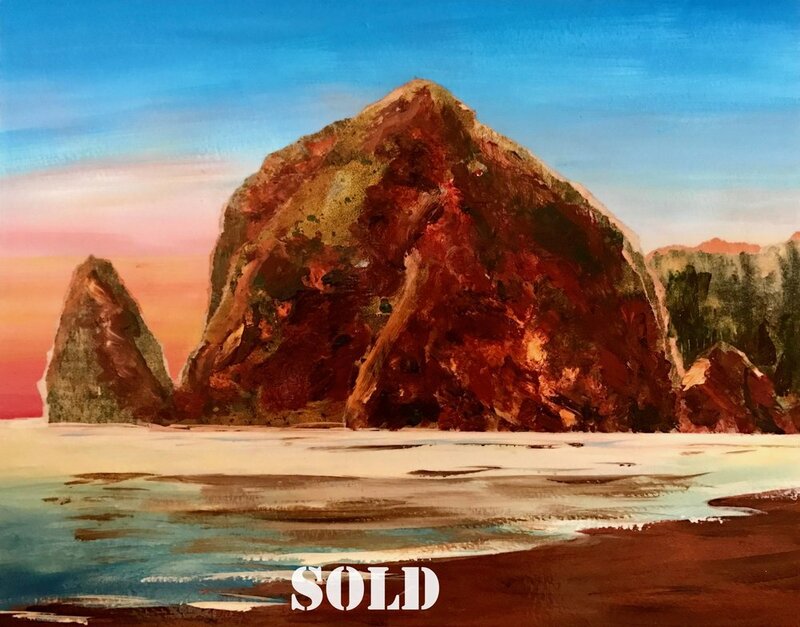 36" x 48"
I highly recommend visiting Smith Rock State Park outside Terrebonne, Oregon. Try a spring or fall weekday. The park can be over-loved on summer weekends with both casual hikers and serious rock climbers, but on those days when the crowds are thin and the sky is clear, it makes for a memorable day. Like this one was. Oil on canvas (palette knife application). 24" x 30"
Nutrias are like less industrious beavers with rat tails. I knew an albino nutria once. He looked like he knew something but wasn’t going to tell it to you. We called him The Oracle. I painted him with a Tarot card so there would be no confusion with other albino nutrias. I don’t remember why I painted him with one of this region’s most iconic Native American petroglyphs, Tsagaglalal, or “She Who Watches,” located on the Washington side of the Columbia River Gorge. Maybe because they both held secrets. Oil on canvas (palette knife application). 30" x 30" I blogged about this one some time ago. At the time, I didn't think all of my experiments on it worked out, but it has grown on me since in all its lumpiness. Oil on canvas (brush application). Not for sale. I read a story in a Colorado newspaper about a firefighter “helping” a bear cub out of a homeowner’s tree. I wondered where the mom was and why she wasn’t “helping” the firefighter lose an arm or face. I love bears. They are the cutest deadly animal. I painted the up-a-tree cub in my front yard with my personal firefighter. Art is the original photoshop. Being on the beach on a sunny day makes you want to wrestle your loved one. Oil on gallery wrapped canvas (brush application). 24" x 18"
Carefree days. Kids and bikes. Oil on canvas (palette knife application). 30" x 24"
I named this Fort Rock 1 because I had plans to paint this many more times. So far, this has been the only one, maybe because I nailed it the first time. Oil on Canvas (pallette knife) 20" x 16"
This is based on a photograph I took at the Agate Beach Motel north of Newport, Oregon. I liked the way the force of the sun setting behind the headland lit up the rock so that it almost became transparent. I tried to paint that. Oil on canvas (palette knife application). Framed. Canvas 24" x 18"
Big Sur is every bit as great as people say. Be prepared for wind and views that go on forever until they disappear in the windblown mist. There is a state park on the California coastline just north of Santa Cruz called Wilder Ranch. There is a trail along the cliffs that you can walk or ride a bike. It’s one of my favorite places on the earth. I take this same photograph every time I go, and I will probably attempt to paint the feeling of the place many more times. Oil on canvas (palette knife application). 20" x 16"
Every leaf is a blob applied via palette knife. It is difficult to photograph and even more difficult to paint. But the effect is very textural and, well, effective. Oil on canvas (palette knife application). 20" x 30"
Oil on canvas (palette knife application). 24" x 18"
This road leads up to a magnificent view. I chose to paint the road instead of the magnificent view. Go figure. Oil on canvas (brush application). 2015 Oil on canvas 12" x 12." Not for sale. Pilot Butte is a cinder cone in the middle of Bend, Oregon that has been preserved as a park. If you hike to the top on a clear day, you can see a line-up of mountains marching north to south along the Cascade Range. Sometimes, late in summer, you can only see smoke in a hundred hues of yellow/orange/brown. Mixed Media on paper, mounted on cradle board. 10" x 8"
An impression of a hike on Eagle Creek Trail a few years before the Eagle Creek fire of 2017. A good remembrance of the trail that used to be.